Yeah, the ones they sell at the food court are good, but these are the frozen ones that come out of a box. They never turn out well, and if you don't eat them fast enough they turn to stone. Since we were sort of "celebrating" last night, we went out for Southern food. 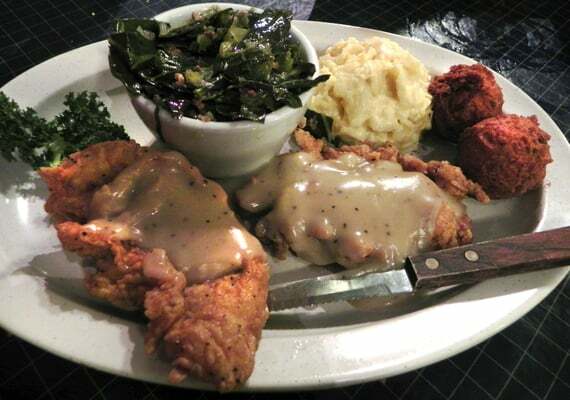 That looks so good... dunno about the collard greens bit, but the rest... yum! Tried one of those new Doritos taco bell taco things... not that impressive. Delicious pizza bagels. I took a picture but my phone is being stupid.... well Facebook is being stupid actually. But yeah... it is comprised of pizza bagels from my work (it has herbs inside, and sauce and cheese baked on top), with basil pesto, mozzarella cheese, and grilled chicken (plus some Italian seasoning). SO GOOD! Just made a meatloaf. Had it with barbecue sauce. There's still half left. I just hope my dad doesn't come home and go, "All right, no going out tonight. We've got dinner right here!" A little meatloaf is great. Too much makes me want to kick puppies. Creamy potato, cheddar, and bacon soup on a cold, rainy day. As good as it gets. Digiorno Meatball Marinara pizza... quite tasty indeed, but still not as good as Deli News in Long Beach. Chicken parmesan with butternut squash risotto. Oh, I love you too, Fresh & Easy. I miss Fresh & Easy. Last night was corned beef with potatoes, carrots and onions cooked in Sam Adam's in a crock pot. It was good, but I would have enjoyed it better if the potatoes had been done separate. This morning I am thinking of finishing off the leftover chicken and egg noodle marinara dish from the night before. Cold breakfast doesn't appeal to me and I am tired of bagels. Yeah, I've got leftover Chinese food and seafood fettuccine and half a pattymelt from a week ago to work through. On top of that there's all this cheese that Stitch and I bought in Palo Alto that I'm slowly starting to break into while he's away. Still leaving enough for him when he gets back. Meatballs and potatoes au gratin... best. comfort food. ever! Better fresh, but reheated is still very yummy. Made a sourdough bread bowl of black bean jalapeno soup with a mountain of pepper jack cheese on top for dinner. Good stuff. Hot Pocket now, diarrhea later. Bought some squash blossoms at the farmers market, stuffed them with ricotta and fried them up. So I have to ask, just what does a squash blossom taste like? Well, when we were eating them with the ricotta I could taste more of the flower, which, oddly, had almost a banana-like flavor to it. It's kind of sweet. When I made them with the chevre, there was so much more flavor and they were amazing and the cheese was so much more manageable than the messy ricotta, which wasn't holding the flowers shut. But you couldn't taste the flower. We did Shakespeare in the park last (they did "Macbeth"), and as usual, we had our little selection of meats and cheeses. This time from Trader Joe's. We discovered the awesomeness that was a blueberry vanilla chevre on challah. That was a real dessert. Nilla Wafers and chocolate milk = SSS Combo.